What makes Thanos the most powerful being in the universe? In Guardians of the Galaxy, when Ronan got stone of infinity on Knowhere and decided to not give the stone to Thanos, Korath told him that Thanos is the most powerful being in the universe. Why is he so powerful? His only abilities so far I can see are achieved using the stones in Avengers. His only visible power is strength, but without stones he would not have chance even against most Avengers in 1v1 fight. I didn't read any Marvel comics, I've just seen the films, so are there any abilities he doesn't use in the films? 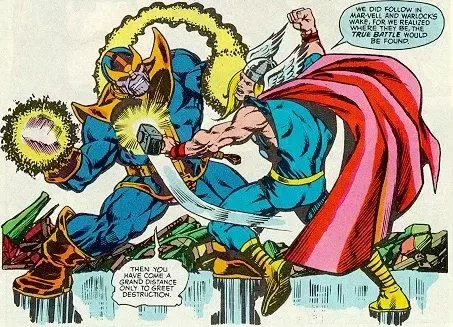 Or why is he considered the most powerful being if he seems so weak without the stones (compared to Avengers, for example)? He's an Eternal of Titan. Even without the Infinity Gauntlet or THOTU Thanos is still very powerful. Thanos is the most powerful of all the Eternals of Titan. He is a superhuman Titan mutant born with the ability to synthesise cosmic energy for his own use and has increased his power by bionic amplification, and mystical enhancement by Death herself after she resurrected him. He is also very intelligent, and his powers are quite powerful. Thanos has vast scientific knowledge way beyond anything on earth and is a master strategist. Thanos is immortal and his body is virtually invulnerable to harm. He is immune to most psionic attacks and can release immense blasts of cosmic energy from his hands and eyes and use psychic attacks. Thanos has vast superhuman strength to a level that he is able take on Thor, Hulk, Beta Ray Bill, The Champion and Tyrant etc. Some people think that Thanos is so dangerous because of how devoted he is. 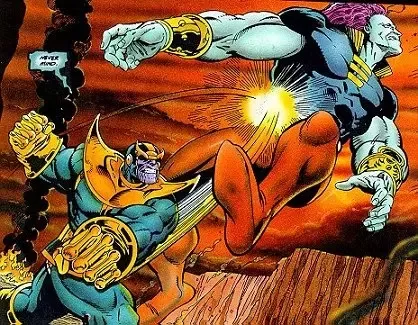 The thing that makes Thanos so dangerous however is his nihilistic mind, intelligence, his love of Death and his potential to acquire omnipotence on a regular basis. Not the answer you're looking for? Browse other questions tagged character marvel-cinematic-universe . Why was Ronan/Thanos not interested in the other Infinity Stone in possession of The Collector? How did Ronan the Accuser become so powerful? Why did Thanos choose to team up with Loki to retrieve the Tesseract? Why didn't Thanos just use the reality stone?